One project done, and several to go! I’ll be honest, I thought I’d be through more projects by now (since we’re about halfway through the Olympics), but I guess my powers of estimation (and powers of sitting comfortably on the couch) are less than perfect these days. 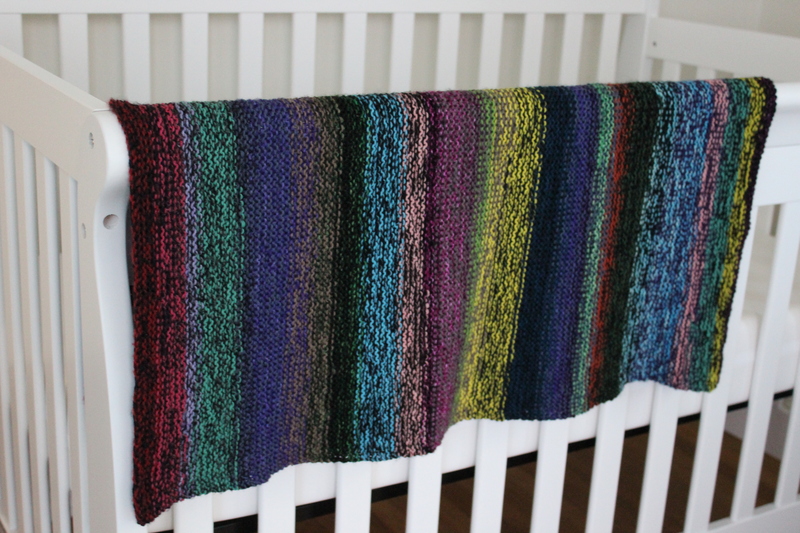 Anyway, I finished the baby blanket, and it turned out great! It’s just about a yard square, insanely soft and squishy. It used up a bunch of my old sock yarn stash, which is great, but I still have plenty of yarn left (maybe even enough to make another blanket?). I wove in my ends and trimmed all the tails on Saturday, and then got right onto the next project. 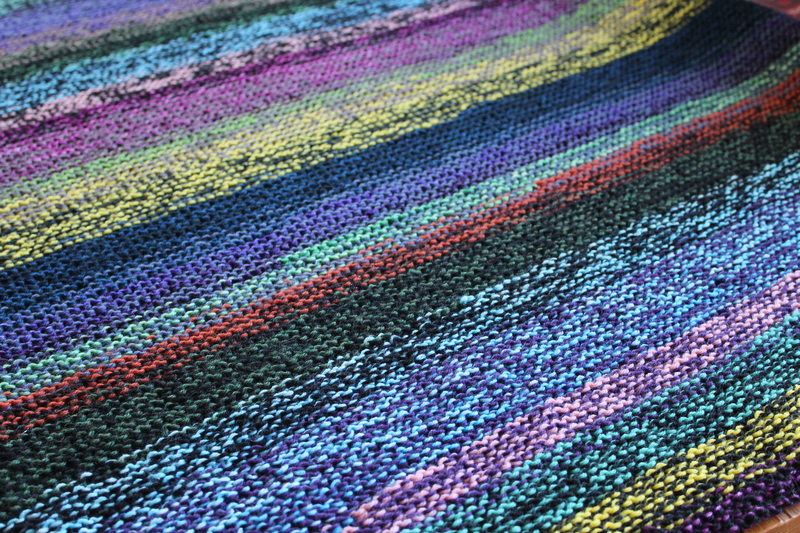 My hand-spun party scarf! It’s been sitting on a shelf for probably three or four years at this point, so I forgot what size needles I had been using (apparently I had stolen the needles out of the project at some point over the years). I ended up ripping out the whole thing, which sent my allergies going (so much dust!). But, after finding the Kleenex, I got down to business. I cast on 30 sts, and just went to town knitting. 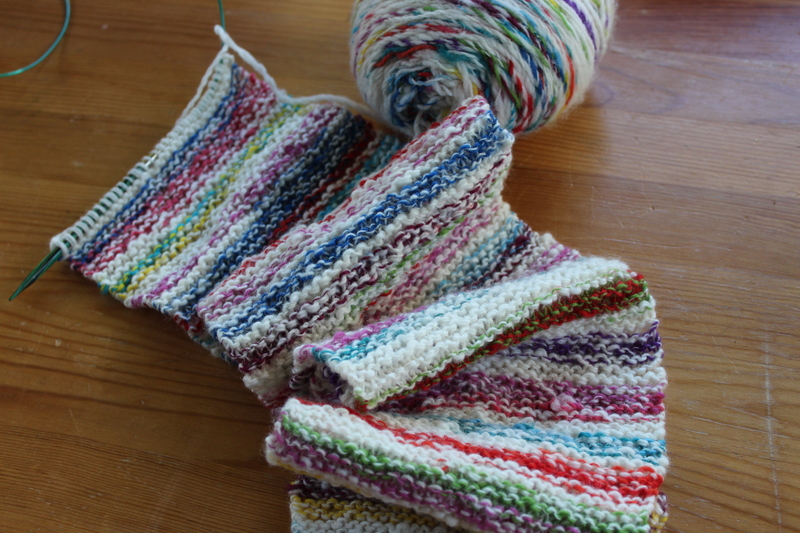 So far I’ve got a little over two feet of knitting done, and I’m loving how it’s turning out. It’s kind of fun making completely brainless projects for once- so much garter stitch!! Now I just have to keep going and not run out of steam! How are your Ravellenic Games projects coming along? This entry was posted in Knitalong and tagged baby blanket, blanket, garter, garter stitch, knitting, ravellenic games, ravellenics 2018, scarf on February 19, 2018 by onemilljellybeans.